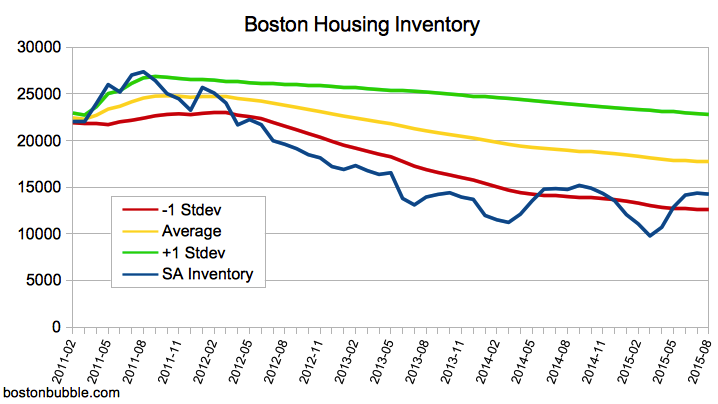 As a first attempt at working out a way to better monitor inventory so that a change in the trend can be spotted more easily, I've converted Zillow's inventory data for the Boston MSA into a seasonally adjusted series. The conversion is simplistic, and if there are suggestions for improvements, please post them. For each month, I adjusted the raw inventory number by the percentage of inventory that the same month represented in all prior years. Below is a graph of the results from January 2011 - August 2015. The graph above would suggest that inventory is bad and not improving. On the plus side, it also appears to no longer be deteriorating. It peaked in August 2011 and then began a multi-year descent. It almost bottomed out in March 2014 but then hit a new low again in March 2015, quite possibly due to the mini ice age we lived through at the beginning of the year. The depth of the data is unfortunately lacking. It only begins in 2010 and is completely dominated by the slide. Suggestions for additional data sources are welcome. Good analysis. This mirrors antecdotally what many people who are looking for houses are seeing; that housing inventory continues to trend down. I'd be interested to know what is keeping inventory off the market. We were told that boomers would be downsizing the next 10+ years, but that does not appear to be happening. Given that housing prices have surpassed the previous peak the 'move up' buyer should have been freed (but apparently is not). Are people still underwater from the last bubble? I am trying to put the story together. Do we have data from the last downtrend and re-uptrend in real estate (the late 80s condo crash)? I wish I knew what the story was. One thing I have heard from prospective "move up" buyers is that they can't sell because they wouldn't have anywhere to go as nothing is available. So it could be gridlock. Lack of inventory might also partly explain why boomers aren't downsizing. In addition, I think many boomers have delayed plans for retirement (including moving) out of financial necessity - many haven't saved enough and those that did save what could have been enough historically are probably being held back by the decimation of bond yields. I don't know of a source for Boston inventory that goes back to the 1980s. If anybody else knows of a source, please post here. I, or somebody, should chain it to the Zillow data. That would improve the seasonality adjustment and also improve the calculation of the average range. Maybe I'll do that when Zillow releases their data for September.